Cook Vegetable & Lamb Kabobs on the grill! 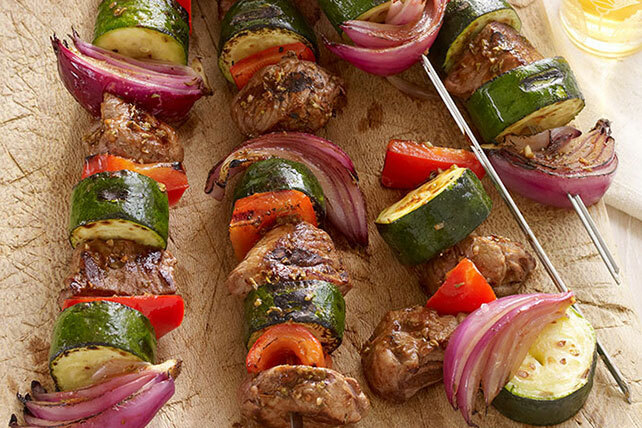 Brush Vegetable & Lamb Kabobs with spicy lemon-garlic sauce and grill until the veggies are crisp and tender. This Healthy Living recipe features veggies like zucchini, red pepper and onions! Thread meat and vegetables alternately onto 4 skewers. Mix remaining ingredients; brush onto kabobs. Grill 12 to 14 min. or until meat is done and vegetables are crisp-tender, turning after 7 min.